is about the ideas and technologies that will enable the affordable movement of people and goods from the surface of the Earth to orbit and beyond. It is about the ideas and technologies that will allow mankind to explore, develop, and colonize space. refers to a group of three proposed space transportation concepts that their promoters claim will make Earth-to-orbit and interplanetary spaceflight affordable, thereby opening the way for the commercial development of lunar mining, asteroid mining, space-based solar power stations, space colonies, and colonies on the Moon, Mars, and in the asteroids. 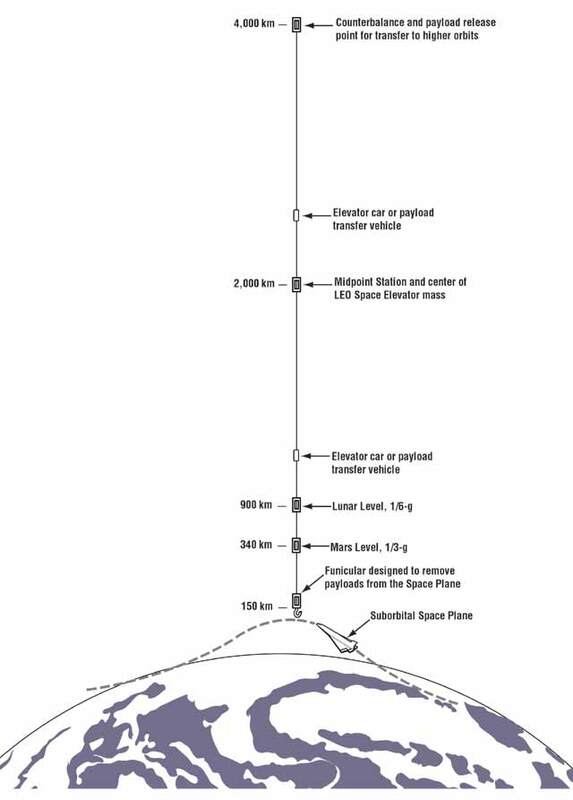 1) A non-rotating Earth surface to geostationary orbit Space Elevator as described by Arthur C. Clarke in his book The Fountains of Paradise. the rotating and non-rotating Skyhooks require either an electrodynamic or ion propulsion system for altitude control while the Earth surface to geostationary orbit Space Elevator does not. Reusability so the investment can be amortized over a large number of trips, a low propellant fraction for reduced operating costs, and a large payload fraction so that the cost of each trip can be distributed over a large amount of payload. Trains, planes, automobiles, trucks, and ships are all very good examples of this. Currently existing expendable rockets are not. When a launch vehicle takes-off to go to Earth orbit, approximately 90% of its take-off weight is propellant, 9% is the weight of the rocket, and 1% is the weight of the payload. Compared to trains, planes, automobiles, trucks, and ships, it should be fairly obvious why the currently existing expendable launch vehicles are somewhat of a failure when it comes to meeting the three main requirements for a commercially affordable mass-market transportation system. the lack of reusability of the launch vehicle. The total speed that a launch vehicle needs to achieve in order to reach low Earth orbit is approximately 9,400 m/s. This includes the speed of low Earth orbit, plus additional velocity for overcoming the force of gravity that is trying to pull the rocket down, and additional velocity for the atmospheric drag as the launch vehicle climbs through the atmosphere. A Skyhook makes spaceflight affordable by reducing the speed the rocket needs to achieve in order to reach low Earth orbit. That reduction in speed means less propellant is required. The reduction in propellant allows the size of the payload to be increased. A larger payload and less propellant reduces the cost of getting to orbit. reducing the speed required for orbit by 1,600 m/s increases the payload by a factor of 6 and reduces the cost by 84%. This process continues as the Skyhook gets longer and applies to both rotating and non-rotating Skyhooks. Reusability of the launch vehicle is the third key issue that needs to be addressed if a Skyhook space transportation system is to become commercially affordable on a mass-market level. Using some of the increased payload capacity that the Skyhook makes possible to make the launch vehicle reusable is an idea that is used and discussed in every reference in this article that discusses either rotating or non-rotating Skyhooks. The specific amount of extra weight that will be required to make a launch vehicle reusable will depend on the details of the launch vehicle design. Is it single-stage-to-orbit, two-stage-to-orbit, ground launched, air launched, catapult launched, air-breathing, all rocket, or a combination propulsion system? All of these will have different requirements in order to make the launch vehicle reusable. But regardless of the details, using some of the increased payload capacity made possible by the Skyhook to go from an expendable launch vehicle to a reusable launch vehicle, will also be a very important step in the process of making spaceflight mass-market affordable: which is the whole purpose of a Skyhook. Conceptually the main difference between a non-rotating Skyhook and an Earth surface to geostationary orbit Space Elevator is that the non-rotating Skyhook does not reach down to the surface of the Earth. The lower end of the non-rotating Skyhook is above the upper edge of the atmosphere and requires a high-speed aircraft/sub-orbital launch vehicle to get there. Since the lower end of the Skyhook is moving at less than orbital velocity for its altitude, a launch vehicle flying there can carry a larger payload than it could carry to orbit on its own. When the cable is long enough, Single-Stage To Skyhook flight with a reusable sub-orbital launch vehicle becomes possible. In addition, unlike a Space Elevator that remains over the same spot on the Earth, a non-rotating Skyhook circles the planet every few hours. This allows the Skyhook to serve as a terminal for sub-orbital launch vehicles arriving from just about anywhere on Earth. This type of Skyhook can start out as short as 200 km and grow to over 4,000 km in length using a bootstrap method that takes advantage of the reduction in launch costs that come with each increase in tether length. This ability to capture sub-orbital launch vehicles coming up from the Earth at the lower end of the cable, and to launch spacecraft to higher orbits from the upper end of the cable, requires energy. Energy that comes from either a solar powered ion propulsion system or an electrodynamic propulsion system on the Skyhook. The advantage of this over current launch systems is the greatly improved operating efficiency and reduced cost of either of these propulsion systems compared to conventional expendable rockets. The process of docking an arriving spacecraft at the lower end of the non-rotating Skyhook starts with the Skyhook in an elliptical orbit. The low point of this elliptical orbit, the perigee, is selected so that the lower end of the Skyhook cable will be at an altitude of 185 km at that point in the orbit. The altitude of the high point of the elliptical orbit, the apogee, is selected based on the mass of the arriving spacecraft. In addition to boosting the arriving spacecraft to the proper speed and altitude for rendezvous, the sub-orbital launch vehicle for this flight will also need to time its take-off so that the arriving spacecraft will rendezvous with the lower end of the Skyhook when the Skyhook is at the low point of its orbit. When the arriving spacecraft docks with the lower end of the Skyhook it will lower the center of gravity of the total Skyhook system, thereby pulling the Skyhook down into a lower more circular orbit. If the apogee altitude of the Skyhook’s initial elliptical orbit was properly selected, the Skyhook will end up in a circular orbit after the arriving spacecraft has docked. Upon completion of the docking maneuver, the Skyhook’s solar-powered ion propulsion system, or electrodynamic propulsion system, is activated so as to start raising the orbital altitude of the Skyhook back to its original altitude. What makes the Skyhook concept work is energy exchange. When the Skyhook is in its initial elliptical orbit it is in a higher-energy orbit than the one it ends up in after the arriving spacecraft docks with the lower end of the Skyhook. What happens is that the Skyhook gives the extra energy of the higher elliptical orbit to the arriving sub-orbital spacecraft; a spacecraft that doesn’t have enough energy to remain in orbit on its own. The end result is that the arriving spacecraft gets an energy boost from the Skyhook that allows it to remain in orbit while the Skyhook gives up energy and drops to a lower energy orbit. Before another arriving spacecraft can dock at the lower end of the Skyhook, the Skyhook will need to use its high efficiency low thrust propulsion system to raise itself back to the original higher-energy orbit. Assume a 200 km long 5,600 kg tether with a 2,000 kg docking crane at each end, a 100,000 kg space station, and a 40,000 kg ion propulsion/power system designed for a flight rate of 12 flights per year. The baseline orbit for this basic start-up Skyhook is an elliptical orbit that has a low point altitude of 350.6 km and a high point altitude of 445.3 km. As with all Skyhooks, it is the center of gravity of the system that is in orbit. Since the speed required for orbit decreases with altitude, those parts of the Skyhook that are below the center of gravity are moving at less than orbital velocity for their altitude and want to move closer to the Earth, while those parts that are above the center of gravity are moving faster than orbital velocity for their altitude and therefore want to move further away from the Earth. The end result is a vertically oriented tether that is under constant tension. Due to this tension, the tether/space station combination acts like a long thin tower with a weight that can be positioned anywhere along its length and the center of gravity of the system is determined by the vertical location of the space station on the tether. Note: the mass for the tether used in this example was calculated using the fiber properties for the T1000GB carbon fiber as shown on the TORAY Industries website, a thermoplastic matrix, a 65% fiber volume, a safety factor of 5 to 1, and an arriving spacecraft mass of 14,800 kg. Preparing for an Arriving Spacecraft In order to prepare the Skyhook for docking with a spacecraft that is coming up from the Earth, the space station will need to be positioned 170.3 km up from the bottom end of the tether. This will put the center of gravity of the Skyhook at the 165.6 km mark. This means that when the Skyhook system is at the low point of its baseline orbit, the bottom end of the tether will be 185 km above the surface of the Earth moving at 96.67% of circular orbit velocity for that altitude. The Launch System The launch system used for this example is a launch vehicle and spacecraft similar in size and performance to the Falcon 9 launch vehicle and Dragon spacecraft. This particular launch vehicle and spacecraft combination has the ability of delivering a 6,000 kg useful payload to a 185 km high circular due east orbit. The calculated useful payload for this system when flying to a 335 km high circular due east orbit is 5514 kg. The calculated useful payload for this system when flying to the bottom of this Skyhook is 7,736 kg. That represents a 40% increase in useful payload when flying to the Skyhook compared to flying directly to a space station in a 335 km high orbit that does not have a Skyhook. Assuming the same cost per flight both with and without the Skyhook, this basic Skyhook will reduce the launch cost of this launch system by 29% compared to flying direct to a space station without a Skyhook. This reduction in launch cost will continue to improve as the length of the Skyhook increases. Hooking Up When an arriving spacecraft docks with the bottom of the Skyhook it lowers the center of gravity of the system. If the arriving spacecraft has a mass of 14,800 kg, it would lower the center of gravity of the Skyhook by 15.6 km: from 165.6 km above the bottom of the tether down to 150 km. This also changes the orbit of the Skyhook from the initial 350.6 x 445.3 km high elliptical orbit to a 335 km high circular orbit. Bringing the Spacecraft and Space Station Together Once the arriving spacecraft is firmly attached to the bottom end of the tether, the space station starts pulling the tether up. At the same time this also pulls the space station down closer to the Earth. The end result is that the center of gravity of the Skyhook stays in the same 335 km high circular orbit while the space station and spacecraft gradually come together and dock. The Orbit Raising Maneuver While the space station is gradually moving down the tether towards the spacecraft, the Skyhook’s ion propulsion system is activated in order to start raising the orbital altitude of the Skyhook. Once the arriving spacecraft has docked with the space station and the crew change has occurred, the spacecraft is lowered ~45 km down from the space station. 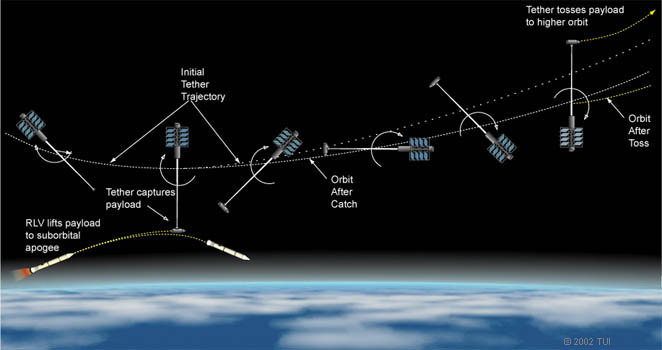 Since the departing spacecraft is moving at less than orbital velocity while hanging on the tether at this altitude, no retro rocket burn is required for the return to Earth, and the release of the spacecraft will need to occur when the Skyhook is in the proper position over the Earth for the departing spacecraft to arrive at its planned landing site. Prior to the release of the departing spacecraft, the docking crane at the lower end of the Skyhook will be used to salvage the spacecraft’s solar array/trunk module in order to add it to the Skyhook’s power system. This solar array is normally discarded and allowed to burn up in the atmosphere when the spacecraft is departing from a space station that is not equipped with a Skyhook. After the departing spacecraft has gone, the ion propulsion system will continue thrusting until the Skyhook is back in its baseline 350.6 x 445.3 km elliptical orbit in time for the next arriving spacecraft. The ion propulsion system will consume a total of 86.7 kg of propellant for this orbit raising maneuver. The upper end of a mature non-rotating Skyhook is designed to be moving at slightly less than escape velocity for its altitude. What this means is that a spacecraft departing from the upper end of the Skyhook can, with the use of only a very small amount of onboard propellant, be headed for geosynchronous orbit, on a free return trajectory to the Moon, on its way to one of the Lagrange Points, or headed for a Near Earth Asteroid. To put this in perspective, consider the Saturn V rocket that was used to fly to the Moon in the late ’60s and early ’70s. The Saturn V had a take-off weight of 6,200,000 pounds. Its payload to low Earth orbit was 260,000 pounds. Its useful payload to Earth escape velocity was 100,000 pounds. Everything else, 6,100,000 pounds worth, was used up and thrown away. Now compare this to a mature non-rotating Skyhook launch system. 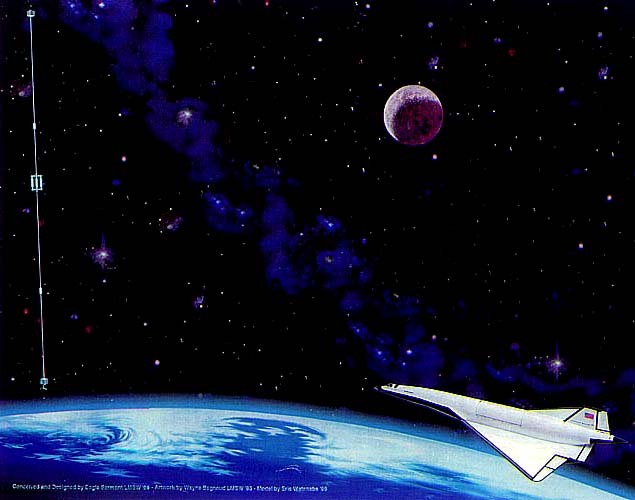 A passenger leaves Earth on a highly reusable suborbital spaceplane that takes off from an airport and flies to the bottom end of the non-rotating Skyhook. The passenger transfers from the spaceplane to the Skyhook and the spaceplane returns to Earth with a load of returning passengers and cargo. The next step in the journey is a ride on the elevator up the tether to the space station in the middle of the Skyhook where a transfer is made to another elevator that is bound for the upper endpoint. Nothing is thrown away everything is reusable. At the upper endpoint station the passenger transfers to a small reusable Earth-Moon spacecraft that is similar to the Apollo Command/Service Module, which will take him/her to lunar orbit. The Earth-Moon spacecraft will use a very small amount of onboard rocket propellant when it departs the upper end of the Skyhook, and will then fire its rocket motor a second time to slow down to lunar orbit velocity when it arrives at the Moon. Upon arrival in lunar orbit, the Earth-Moon spacecraft will rendezvous and dock with a reusable single stage Lunar Lander that is carrying passengers and cargo bound for Earth plus additional rocket propellant for the Earth-Moon spacecraft. 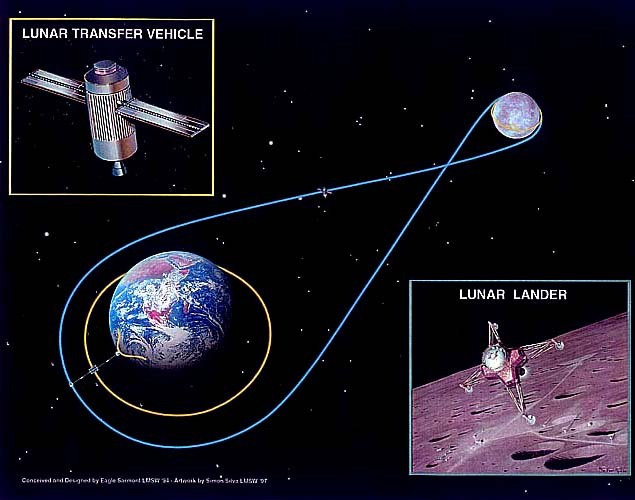 After the passenger, cargo, and propellant exchange is complete, the Lunar Lander leaves lunar orbit and descends to the surface of the Moon. Again, everything is reusable, nothing is thrown away, and the rocket propellant for the Lunar Lander and the Earth-Moon spacecraft comes from the Moon. 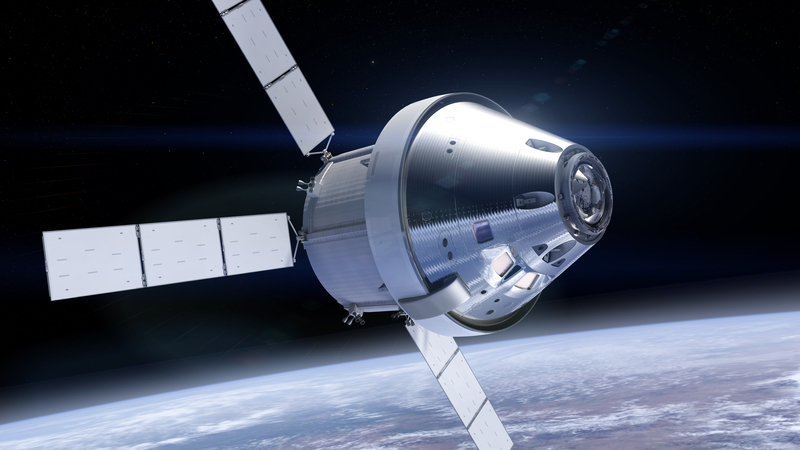 NASA is currently funding the development of a reusable Earth-Moon/Earth-Asteroid spacecraft that is similar to an Apollo Command/Service Module called the Orion spacecraft. Operate this spacecraft from the upper end of a non-rotating Skyhook and we will have an affordable transportation system for traveling to lunar orbit, the Earth/Moon Lagrange points, and the near Earth asteroids. Add a single stage reusable Lunar Lander and we will have an affordable transportation system for going to the lunar surface. With access to Lunar and/or near Earth asteroid materials, the building of a large, well shielded, rotating, Mars cycler spacecraft becomes possible, and safe regular affordable interplanetary spaceflight to Mars, the Moons of Mars, as well as Ceres and all the other asteroids between Mars and Jupiter, becomes possible. In 1984, Paul Penzo of JPL proposed a planetary surface to escape velocity tether transportation system for Mars that consists of two unpowered non-rotating Skyhooks; one attached to the Martian moon Phobos, and the other attached to the Martian moon Deimos. With this system, a spacecraft arriving at Mars, either direct from Earth, from an outpost space station, or from an Earth-Mars cycler spacecraft as it swings by Mars, docks at the upper end of the non-rotating Skyhook attached to the outer moon Deimos. The people and cargo on that spacecraft then transfer to an elevator on the Skyhook that will take them down to the lower end of the Deimos Skyhook. There they board a small orbital transfer vehicle that will take them to the upper end of the non-rotating Skyhook that is attached to the inner moon Phobos. Again they transfer to an elevator that will take them to the lower end of the Phobos Skyhook where they will transfer to the reusable single stage Mars Lander that will carry them to the Martian surface. Passengers and cargo from the Martian surface that are bound for either the asteroids, or for Earth, would ride the system in reverse. 1) Sarmont, E. (26 May 1990). An Orbiting Skyhook: Affordable Access to Space. International Space Development Conference (Anaheim California). 2) Moravec, H (1978). “Non-Synchronous Orbital Skyhooks for the Moon and Mars with Conventional Materials”. Archived from the original on 1999-02-03. 3) Smitherman, D.V. “Space Elevators, An Advanced Earth-Space Infrastructure for the New Millennium”. NASA/CP-2000-210429. Archived from the original on 2007-02-21. 4) Bogar, Thomas J.; Bangham, Michal E.; Forward, Robert L.; Lewis, Mark J. (7 January 2000). “Hypersonic Airplane Space Tether Orbital Launch System”. Research Grant No. 07600-018l Phase I Final Report (PDF). NASA Institute for Advanced Concepts. Archived (PDF) from the original on 2005-12-18. Retrieved 2014-03-20. 5) Dvorsky, G. (13 February 2013). “Why we’ll probably never build a space elevator”. com. 6) Feltman, R. (7 March 2013). “Why Don’t We Have Space Elevators?”. Popular Mechanics. 7) Scharr, Jillian (29 May 2013). “Space Elevators On Hold At Least Until Stronger Materials Are Available, Experts Say”. Huffington Post. 8) Templeton, Graham (6 March 2014). 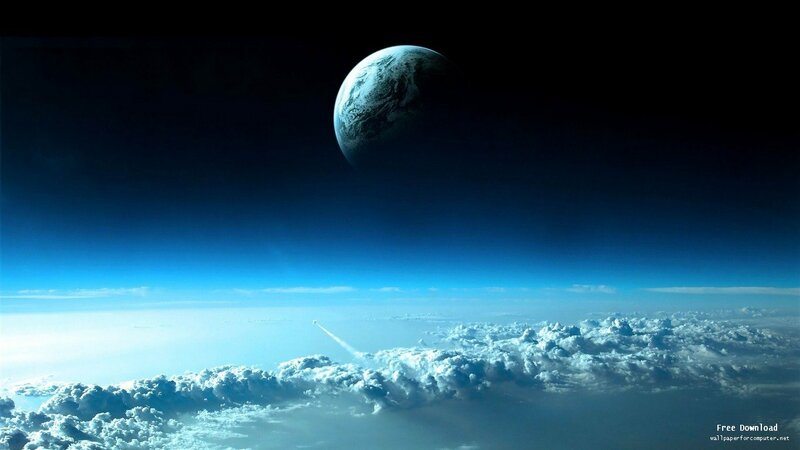 “60,000 miles up: Space elevator could be built by 2035, says new study”. Extreme Tech. Retrieved 2014-04-19. 9) Darnell (10 April 2009). “Are Traditional Space Elevators the Wrong Way Up?”. Colony Worlds. Archived from the original on 2009-07-14. 10) Chen, Yi; Huang, Rui; Ren, Xianlin; He, Liping; He, Ye (2013). “History of the Tether Concept and Tether Missions: A Review”. ISRN Astronomy and Astrophysics 2013. doi:1155/2013/502973. Retrieved 2014-03-07. 11) Cosmo, M.; Lorenzini, E. (December 1997). Tethers in Space Handbook (PDF) (Third ed.). Smithsonian Astrophysical Observatory. Archived (PDF) from the original on 2003-03-22. 12) Sarmont, E. (October 1994). “How an Earth Orbiting Tether Makes Possible an Affordable Earth-Moon Space Transportation System”. SAE 942120. 13) Sarmont, E. (July 2014). 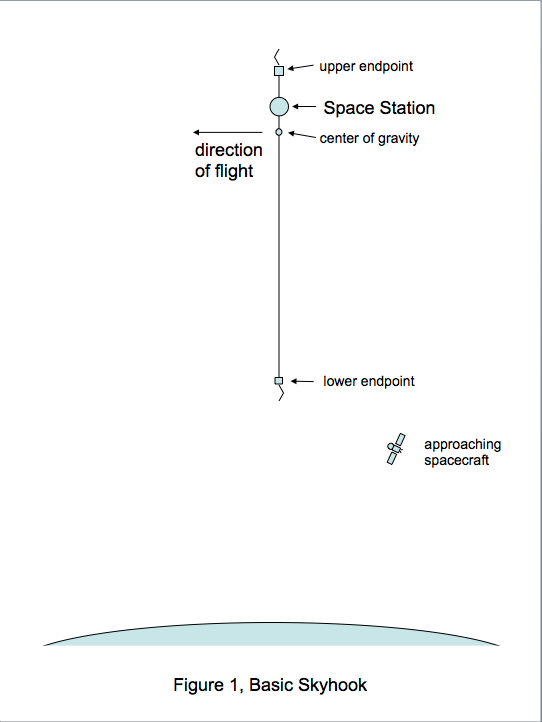 “Affordable Access to Space: Basic Non-Rotating Skyhook with Falcon 9 & Dragon” (PDF). 14) Wilson, N. (August 1998). “Space Elevators, Space Hotels and Space Tourism”. SpaceFuture.com. 15) Mottinger, T; Marshall, L. “The Bridge to Space – A space access architecture”. AIAA 2000-5138. 16) Mottinger, T; Marshall, L (2001). “The Bridge to Space Launch System”. Space Technology and Applications International Forum. CP552. 17) Marshall, L; Ladner, D; McCandless, B (2002). “The Bridge to Space: Elevator Sizing & Performance Analysis”. Space Technology and Applications International Forum. CP608. 18) Stasko, S; Flandro, G. “The Feasibility of an Earth Orbiting Tether Propulsion System”. AIAA 2004-3901. 19) Zubrin, R (September 1993). “The Hypersonic Skyhook”. Analog Science Fiction / Science Fact 113 (11): 60–70. 20) Zubrin, R (March 1995). “The Hypersonic Skyhook”. Journal of the British Interplanetary Society 48 (3): 123–128. Bibcode:..48..123Z. 21) Andrews, D. (3 September 2009). “Advanced ETO Space Transportation”. NASA Langley Advanced Space Transportation Workshop. Archived from the original on 2014-07-13. 22) Andrews, D. “Space Colonization: A Study of Supply and Demand” (PDF). Archived (PDF) from the original on 2012-03-11. 23) Sarmont, E. “Affordable to the Individual Spaceflight”. Archived from the original on 2007-02-13. 24) “The Incredible Ions of Space Propulsion”. Science at NASA. NASA. 16 June 2000. Archived from the original on 2011-10-23. 25) Sovey, J.S. ; Rawlin, V.K. ; Patterson, M.J. (May–June 2001). “Ion Propulsion Development Projects in U.S.: Space Electric Rocket Test 1 to Deep Space 1”. Journal of Propulsion and Power 17 (3): 517–526. 26) Penzo, P. (July 1984). Tethers for Mars Space Operations. The Case for Mars II. 62 Science and Technology Series. pp. 445–465. 27) Orion spacecraPenzo, P; Carroll, J (December 1997). Mars Moons Tether Transport System (PDF). Tethers in Space Handbook (3rd ed.). pp. 70–71. Archived (PDF) from the original on 2003-03-22.